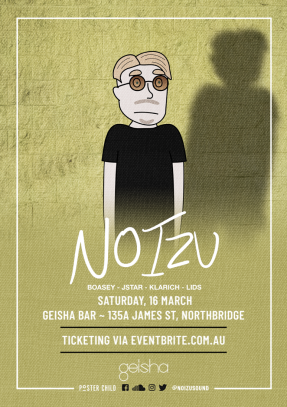 We are super excited to be hosting one of the fastest growing names in house music, NOIZU for his debut Australian Tour! With some hefty collabs and solo bangers out across the interwebz, Noizu has solidified his name as one of the top dogs of the Bass/Tech house scene! Noizu from Los Angeles, made his debut on the HOWSLA EP with his song Lasers after being selected by Chris Lake & Skrillex. Lasers caught the eye of Tchami and Noizu released his debut EP, JUNGLE EP on Confession to an amazing reaction. After a huge amount of support from A List Djs he was asked to remix DJ Snakes hit “a different way”. His first ever remix is at 1.7m streams and featured on Spotifys Mint playlist. He ended 2017 making his debut tour supporting Tchami, Malaa and Rezz. 2018 started with a bang, an official Tchami remix and now his first single of 2018, LFO. Accompanied with incredible visual animation the Noizu story is just beginning. Keep an eye out for huge collaborations and remixes coming very soon.